So, we go out to this big park for soccer practice. Might as well take Chubby dog and hubby (not chubby) and hike the trail. It’s about 2.5 miles, and fairly flat. After every mile, according to my GPS watch, I threw in a few squats for good measure. 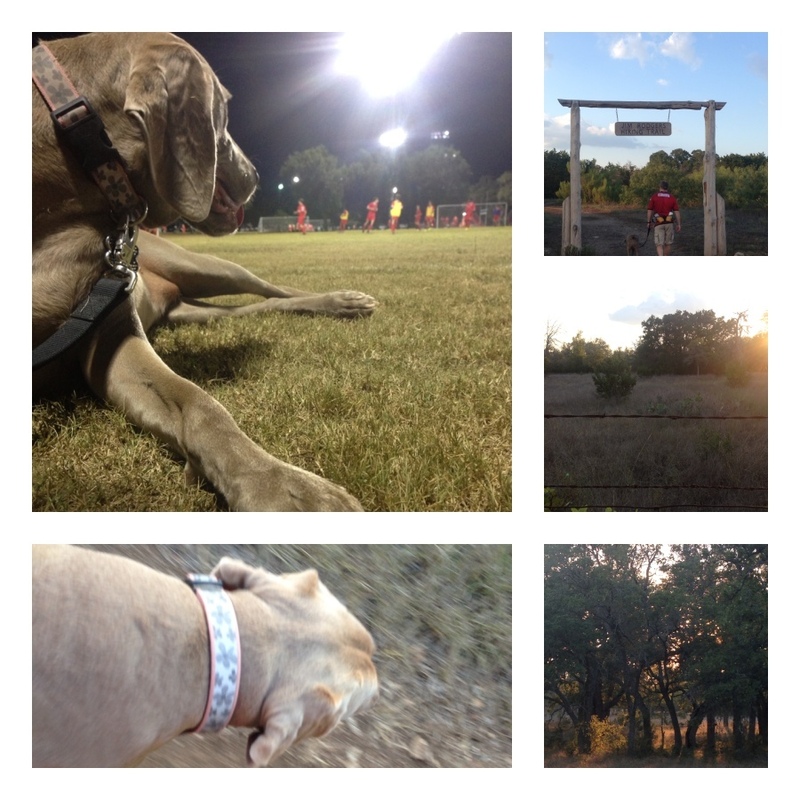 Gorgeous warm night, and so therapeutic to get OUTSIDE! Man, there’s nothing better than a little nature to pull the blood pressure back down and put things in perspective. Nature Deficit Disorder cannot win when you go outside and breathe it in! I can’t go more than a few steps without finding something interesting to look at. Something rustles off to the left, a bunny on the trail ahead, a deer watching warily, the sunset getting more colorful every minute, the way the sunlight filters through the trees, the chance to rehash the day and talk about stuff and things. If you do anything in the next few days, be sure to get outside and breathe deeply. Find something to stimulate your senses without whipping out Words With Friends. Just be. I love to sweat! I have always loved to sweat. I don’t mean the sweat in your work clothes because it’s 105 degrees kind of sweat, I mean the good, clean, pour outta your pores kind. The kind that comes with the sort of activity that’s so fun, that before you even notice it, you’ve got sweat dripping off your elbows. That’s a good sweat right there. So, sitting in a sauna sounds boring and awful, and I’ve always been an avoider. When my mom (and all of us, really) were suffering with her Alzheimer’s, I started reading about natural medicine and really exploring staying healthy and detoxification. I ran across an article on Far and Near Infrared saunas and their many health benefits. I bought one. I had inherited a little money from my mom, and decided that she would want me to be healthy. That, and they were on super-duper half price, year-end model sale. It arrived in HUGE boxes and my hubby and I fit all the pieces together, and low and behold, it worked. I have used it off and on, and so has my family. There are multiple settings: detoxification, skin, pain relief, weight loss, relaxation and so on. Mine lives in our garage. A 30 Minute Sweat in Infrared Sauna… Now that’s a good sweat! Recently, I read an article by a doctor who mentioned how much he loves and believes in his Infrared Sauna. This endorsement inspired me to ramp up my “consistency” factor on the sauna. I’m feeling great. I’m sweating buckets of toxins, sleeping better and my back hurts far less. So, I may not be getting in my 4 workouts every week, I am getting in my sweaty sauna time. I bring my iPhone out there and use a speaker to listen to an audible book. I’m reading 52 Books this year so there’s no time to waste! There’s a built-in stereo/cd player, but I prefer books or my music library. The sauna makers say that you can burn up to 600 calories in a session and that the benefits run the gamut from cardiovascular to better skin. 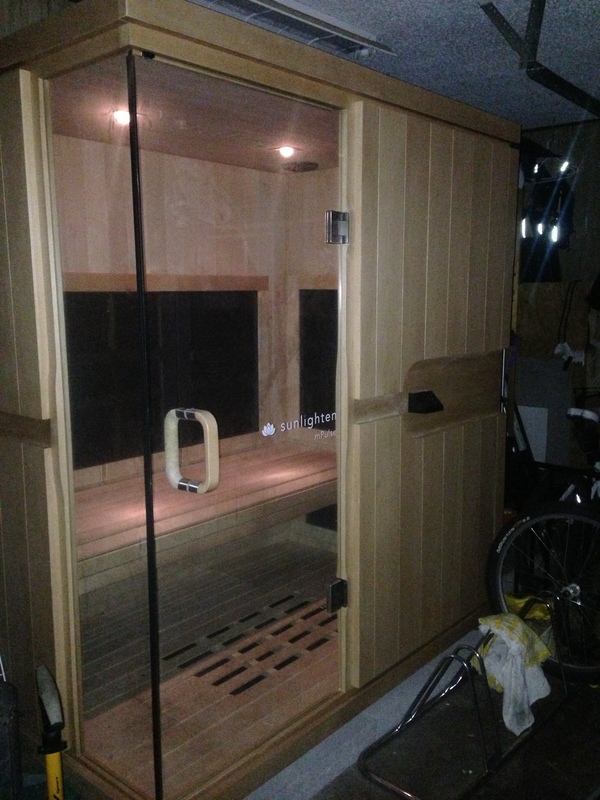 I have seen sessions in a sauna just like mine listed at a local spa for over $100/session. What? That makes me feel smart. I’m well on my way to breaking even. Maybe I should invite friends and charge a dollar a minute to keep me company? Either way, I’m suddenly loving my sauna! Here’s an article by Dr. Mark Hyman.